This symbolic necklace pays tribute to the accomplishments of empowered women everywhere. 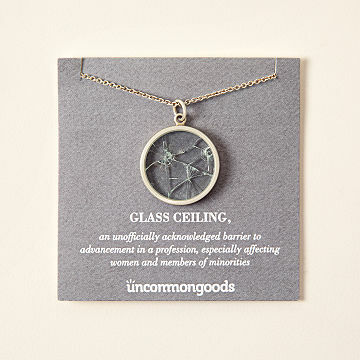 The Shattered Glass Ceiling Necklace® is a tribute to all the women who have ever crushed it. This modern pendant's focal point is a piece of manually cracked glass that symbolizes all the milestone breakthroughs achieved by women past, present, and future. It's displayed between two solid panes, and the design is finished with a satin sterling silver setting and chain. Imported glass; Handmade in Brooklyn, New York. Check out our Shattered Glass Ceiling Paperweight® here. Keep out of direct contact with water. Glass is manually cracked and each piece will vary. Beautiful and original gift for those who rise above and shatter ceilings everywhere. The recipient absolutely loved it and the meaning behind it! I love this necklace, asthetically and emotionally. I was given this necklace as a gift, and it meant a great deal - in turn I purchased another to give as a gift to a woman I very much admire that helped me break my 'glass ceiling'. Was disappointed to see the difference between the image and the actual item. Makes a lovely and meaningful gift. This was a great quiet gift for our female client CEO's who impact our business. What a great and empowering quiet way to call out the hard work and sacrifices many leaders have to make in today's hectic world. I gave this product to my wife from our kids to show how much we appreciate all her hard work and education achievements. Beautiful piece that has a lot of meaning and symbolism. Bought it for a graduation present for a friend that has and will continue to shatter all obstacles in her way. I received this necklace as a gift about a year ago and I get SO many compliments when I wear it (which is all the time because it reminds me to be a boss, fight the patriarchy, and to keep fighting for the things I want).